We’re heading into summer with the return of some favorite shows. 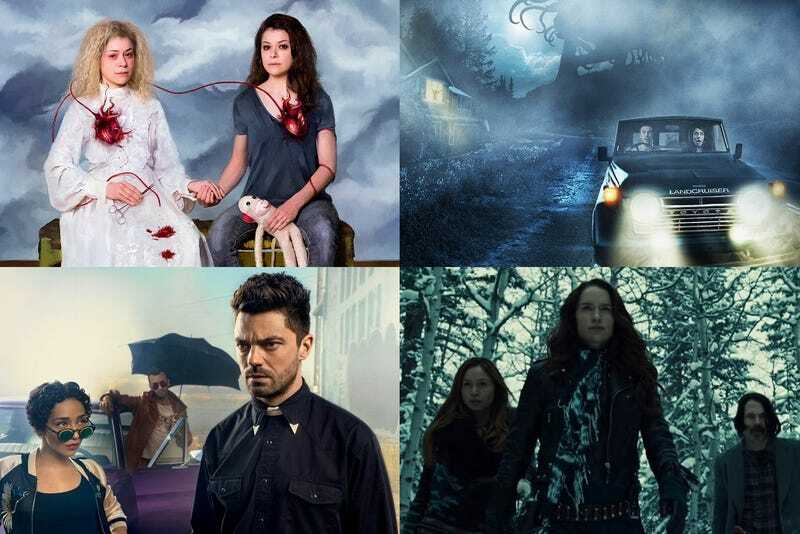 Only a few new shows this month, including one based on a Stephen King novella, a Disney cartoon, and Syfy’s grindhouse series featuring blood-guzzling race cars. Check below to find out about the upcoming premieres and finales. Gifted with the superhuman power to harness and control electricity, Jefferson Pierce used those powers to keep his hometown streets safe as the masked vigilante Black Lightning. However, after too many nights with his life on the line, and seeing the effects of the damage and loss that his alter ego was inflicting on his family, he left his Super Hero days behind and settled into being a principal and a dad. Almost a decade later, Pierce’s crime-fighting days are long behind him…or so he thought. But with crime and corruption spreading like wildfire, and those he cares about in the cross hairs of the menacing local gang The One Hundred, Black Lightning returns — to save not only his family, but also the soul of his community. The Shannara Chronicles (Spike) - Fall?